I just went back and read my 2018 goals that I posted last year around this time and I'm pretty impressed that I made great progress on most of them. 2018 was one of the greatest years of my life. Aside from making so many memories and really coming into my own, the highlight was definitely having the opportunity to travel so much which really lit up my soul and helped to guide me on my path. In the past, I've really loved New Year's Resolutions and the start of a New Year. Something about a fresh start always excites me. However, I will say, I'm not really so focused on it this year. I've spent a lot of time working on my inner peace and enjoying the process and journey of things as opposed to the destinations. I believe in working hard and taking action to achieve your goals, but I also believe that, at a certain point, we have to just let go and let the force bigger than us take control. I've been reading and re-reading A Return to Love and really trying to allow myself to loosen the reins and just enjoy the ride. However, I love goal setting and I even got some requests to share my goals for 2019, so gotta give the people what they want :) Enjoy and let me know on Instagram what your goals are for the New Year. Complete at least one round of the FASTer Way to Fat Loss. This is #1 right now because I'm getting ready to start this round on Monday. My fitness game has really fallen to the side since being abroad, so I need this so much. I'm really excited to start. Run another half marathon and get strong enough to train for a full marathon. I would love to train for another half marathon this spring and (maybe maybe) train for a full marathon in the fall. I'm not going to pressure myself to do the full, but I think a half is pretty doable. This has been a goal of mine for a few years and I feel weird putting it out there in the universe and on the internet, but I think the perfect time for me to do this is while I'm in college, so fingers crossed I can make it happen. Really implement a good, peace focused morning and night routine. My phone is NOT going to be apart of either of these routines, you heard it here first. I really challenge you to do the same. The quality of my mornings and my sleep is so much better when I put away the blue light. Goals for the morning are daily meditation and gratitude practice and goals for the evening are spending 20-30 minutes reading and/or writing. Once I get back into a good groove, I will do a post on this. Purchase and practice A Course in Miracles. I love Marianne Williamson so much and whenever I finish annotating (I know this is extra, but I'm obsessed) A Return to Love, I want to start reading A Course in Miracles in the morning as apart of my routine. Consciously practice kindness every day. I've really been working on spreading more kindness in the last year. It's important to me to spread the positive energy that I want to feel in my life, so this is a daily practice for me and I think everyone needs a little reminder every once in a while :) Change begins with us and we can all shift to be a little kinder. Reach out to old and new friends more often. I've realized recently that I'm so horrible at keeping in touch with people. I'm kind of the worst at texting, but now that I'm getting older and have met so many friends in different places, it's important to me that I make an effort to really sustain those friendships, even if it's just a check-in text. Get involved in organizations besides Greek life. I have always loved volunteering and helping other people. It really lights me up to get outside of my own self. I also want to dedicate more time to other passions I have that don't relate to the sorority. I love math and my accounting classes, but I am going to dedicate more time to letting myself be creative whether that's writing or playing music or whatever. I have a couple of fun potential projects with some other organizations that I'm excited about, so hopefully that will work out. This is in the works, so fingers crossed!!! Thanks for reading and Happy New Year! Let's make this a great one. 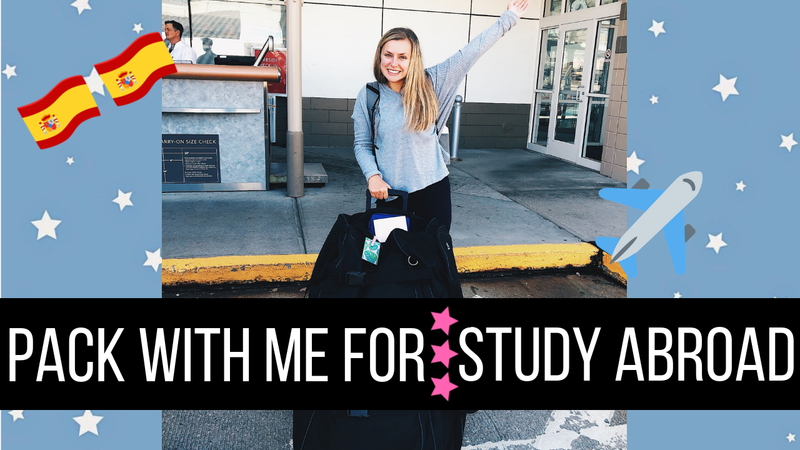 I have received quite a few questions on Instagram throughout the semester about my study abroad experience and I thought I would throw them all together in one post. Also, exciting news: I found a fully edited vlog in my iMovie archives that I never uploaded, so I have been waiting to write this post to publish it! I started vlogging about 4 weeks before and then up until the day I left for Barcelona, so everything I bought and did to prepare is documented in the vlog, which I think will be super helpful if you're getting ready to go abroad. As always, my Instagram DM's are open for any other questions and I hope this post and vlog is helpful! Click here if you want to open the video in YouTube. ☆ How did you fit everything into your suitcase?! You'll see in my video, but I bought organizer bags and compression bags from Target. These really helped me stayed organized and fit things in, so I highly recommend those- especially the compression bags. I wish I would have had more of those. I borrowed a massive suitcase from my dad that probably could've fit two people inside. I think if you are an efficient packer, you could get away with one large checked bag, a carry on suitcase, and a big backpack (if you can take two items with you on the plane). I got the Patagonia Black Hole Backpack in the biggest size and I'm SO glad that I did. It was a little pricier than my usual school backpack, but it was perfect for everyday and long weekend trips. - Tons of underwear and socks: I had to pay for laundry so I tried to bring enough underwear and socks to last me 2-3 weeks. - Wait to buy shampoo/conditioner, body wash, lotions etc: you will be able to find everything you need. - Extras of products you love: you can get a ton of stuff abroad, especially in Europe, but if you have skincare or makeup products you love, it never hurts to purchase more ahead of time. - Empty travel sized containers and products (toothpaste, dry shampoo): really helpful for weekend trips because you can only take travel sized products in your carry on bags. - Bring more comfy clothes than you would think! I spent a lot more time lounging in my room than I expected that I would. - Don't overpack shoes! You aren't going to wear heels out and about because there's so much walking. - In terms of clothes: pack extra jeans because these will become your everyday staple if you're in Europe. I never wore jeans to class before this semester. Also, neutral colored jackets (I had a green military style jacket and a jean jacket) that you can pair with tops and jeans and dresses. Pack lighter for the season that you are going into and more for the season that you will be leaving in (so for me: I came in the summer and am leaving in the winter) : I wish I would have brought more fall and winter clothes as opposed to so many summer clothes and shoes. ☆ Do you feel the same stress with classes abroad as you would at UK? Classes are very different abroad than at home, not necessarily "easier". They tend to be longer (mine are 1 hour and 40 minutes) and there are a lot of group projects. There is a little bit of homework, but, in my experience, I've had 1-2 group projects and 2 exams per class to focus on. You can't really get by not studying or doing any work, but I would definitely not consider it as stressful. ☆ How many euros a day should I budget if I'm studying abroad for the semester? Oy.... I'm probably not the best person to answer hahaha. No, actually I feel like I've done an okay job budgeting. It was important for me to travel as much as I could, so I definitely did that, but I'm coming home with verryyyy few pennies in my pocket. In my opinion, I get to work for the rest of my life, so having these experiences is worth it to me. Answering the question, I would budget an average of $200 per week. You definitely won't need that much every single week if you don't travel a ton because some weeks I would only spend 20 euros in one week when I stayed in Barcelona. Traveling can get pricy, so that's why I say "an average". However, I've also become a frequent Zara shopper, so there's that LOL. My tips for saving money are cooking and making coffee at home. Buy tupperware and pack your lunch during the week, so you have more money to eat out or shop on the weekends. If you're like me and have been working and saving money for years for this experience, I think now is the time of your life when it's okay to spend on experiences. ☆ Best places to visit in Spain? I travelled to Sitges, Valencia, Peniscola, and Sevilla. All of those spots are incredible. I wish I would've made it to San Sebastian because I've heard it's amazing. ☆ What did you do for a phone plan? I have Sprint and they offer a pretty great international plan, so it didn't end up costing anything extra to text or use very slow data and my calls were 25 cents a minute. My friends with AT&T and Verizon got a new SIM card from local cell phone carriers that cost ~20 euros per month. ☆ What was your Spanish visa process like? You have to have a visa if you are planning on being in Spain for more than 90 days. Spanish visas require you to apply in person and the closest embassy to me was in Chicago (every state has a designated location). I went to their website, requested my appointment, and printed the application paperwork. You fill out the application, get all your documents, photos, and prepaid envelope together, and head to your appointment. It's super quick (mine was around 10 minutes)- they take your application and passport and mail your passport back to you within six weeks. Mine actually was mailed to me within two weeks of my appointment. It feels super stressful trying to get everything together, but the appointment itself is no big deal. ☆ What was included in the price of your program? I did my program through ISA and the price of my program included tuition, housing, 2 full weekend trips + 1 day trip to Spanish cities, insurance, airport transportation, and a full staff in Barcelona that was available for support. I have had zero issues this semester and I'm so thankful I chose to go through ISA. ☆ What is your housing situation like? So I live in a "residencia" which is basically like a combination of a college dorm and a hotel. We have 24/7 front desk staff and a weekly cleaning service, but only students live in our building, I share a twin bed room and a small bathroom with my roomie, and we share a kitchen with everyone on our floor. It's been an interesting experience for sure and, looking back, I'd probably choose a regular apartment, but I definitely have some great stories from living here haha. I think that's just about everything! If you have any more questions about study abroad, my DMs are always open. This has been an unbelievable experience and, if you're getting ready to go, get ready for the time of your life!! You are getting ready to embark on your study abroad journey to Barcelona. You're nervous and excited about leaving home for the first time in your life. You will learn how to be independent like never before. You have no idea what the future holds, but that's okay. The unknown of the future is what is so exciting- the possibilities are endless! Your worries about adjusting to this new chapter and making new friends are totally valid, but there are far better things ahead than you can even imagine. Be open to new friendships and experiences. Say yes, even when you're scared. Don't pack so many shoes! Call Mom and Dad and say thank you for everything and how much you miss them. Oh, and resist the urge to pop into Zara and spend $100 on random Tuesday afternoons! You will spend every penny you've worked so hard to earn, traveling exactly where you wanted to go and it was SO worth it, I promise. You saw Sitges, London, Italy, the Canary Islands, Portugal, Valencia, Dublin, Paris, Sevilla, and Germany---freaking amazing!!! But Barcelona will always be your favorite. You will meet Jess, Nellie, Kat, Wes, Mac, Arturo, and so many others and form incredible relationships with each of them. Together you will travel to new cities, eat amazing brunch food (your favorite), and stay up way too late at Spanish night clubs. You are going to realize how, despite so many differences and being from all over the world, people are a lot more similar than you think. It will blow your mind how so many people with different goals, dreams, and stories can come together and share such incredible memories. Traveling with Drew is going to end up being the best decision we've ever made for our relationship. You're going to see just how lucky you are to share these experiences with him and how special your bond really is... I mean who gets to watch the sunset at the top of the Eiffel Tower with their boyfriend at 20??? You'll begin to understand that your past fears about the future are so small in comparison to the greater plan that exists. God has a plan and He has your back! Everything is going to play out exactly how it is supposed to. I'm so grateful to you for believing in yourself enough to take this leap and grow beyond your comfort zone. For a really long time, you've been a "box checker"- moving through life at lightning speed just to get things done and check the boxes of what you're supposed to do. I can tell you now, after four months of simply following your heart, it's okay to trust your instincts and stop and enjoy little moments and victories. You are way more capable than you give yourself credit for and you know what's best for you. It's okay to be proud of yourself for all that you've accomplished and how hard you've worked. In this moment, getting ready to go home and end this chapter, I never expected to feel such sadness, but this is only the beginning of everything that is to come. For the first time in your life, on December 11th, 2018, you can look back on this chapter of your life and know you did everything that you set out to do. You have zero regrets and, for once, the unknown of the future is really exciting. Never lose that feeling, promise? I'm so proud of you. Today I am finally sharing some healthy tips...it's about time! I wrote about some of my "health/wellness" fears going into study abroad in this post, but I've gotten some questions on Balanced Baig about staying healthy while actually being abroad. Being abroad, in general, is a learn as you go situation. I'm constantly proving myself wrong and learning new things. I've been working on strengthening my relationship with my body and shifting my perception of what it means to be healthy (go read my recent post on wellness if you want to hear more about this). I am so grateful to be healthy and able to travel and push myself out of my comfort zone physically, mentally, and emotionally during this time, but it never hurts to figure out how you can eat and move to feel your best. First things first, I shared a what I eat in a day vlog on Youtube a few weeks ago. I was waiting to write this post to share the video, so that I could link the video and have all my tips in one place. This vlog is just a quick little glimpse into my day, but hopefully you can see how I put some of these tips into action! It helps that I have a kitchen in my building and can cook during the week, but I've definitely picked up a few tips and tricks along the way that I'm going to share. I'm only sharing these tips because I feel most confident when I know I'm doing what I can to feel good. Am I at the top of my fitness game right now? Not really, hahaha. But whenever you're traveling for a long period of time, you do what you can to make it work while still indulging and exploring new places and cultures. I freaking love food. Last week, I think my mom and I ate gelato 5 nights in a row and it was incredible. This might be boring/common sense, but moveee! It's easy to call an Uber or ride public transport around, but I think walking everywhere has helped me the most. Obviously sometimes it thunderstorms or places are far away, but so far, I've only ridden the metro to class one time! It does take longer, but when you're in a new place, it's fun to explore new streets and get moving. I share this way too much on Instagram stories, but I am in love with Melissa Wood Tupperburg and her workouts. Any time I feel like I've been way too overindulgent, I do her workouts (in my tiny little room with zero equipment) and my mood is instantly elevated. Not that this is the most important thing (although it never hurts), but I feel like I see a change in the appearance of my body almost immediately. Did you read my latest post with Kelsey Boudreaux all about intermittent fasting? I love what she is doing with the FASTer Way to Fat Loss program and I may have signed my boyfriend and I up for her New Years round...I love weaseling him into little fitness challenges with me hahaha. Anyways, I mentioned in the post that I try to do it casually. Basically, I try to wait at least 12 hours in between eating meals, but ideally, like 14 or 16. If I eat dinner at 9, I try to wait to have breakfast til like noon. I think the most important thing to note here is to listen to your body and eat if you're starving. For me personally, something about getting my walk to school in on an empty stomach really makes me feel good. Read Kelsey's post to learn more about the science behind IF. I try really hard to get my greens in every day. Even if it's a handful of spinach on an egg, cheese, and avocado bagel, I add it in. Travel is tough because sometimes greens either aren't on the menu or Nutella pancakes sound so much better. I'm guilty. Do what you can here. If you're a student/have access to a kitchen, fresh veggies are so cheap in Europe. I like to add tons of greens and veggies to scrambled eggs, pasta, or salads when I'm home. I've been horrible about budgeting being abroad. Every time I check my bank account, I think I kill a little piece of my soul. Buying tupperware helps me to a) save money by not eating out every day and b) make healthy meals to pack and throw in my backpack. I share a lot of my Tupperware meals on Insta stories, but I could do a blog post on some of my fave "recipes" if it's something you're interested in. I also bought a to-go coffee cup last week to save money on my morning coffee. I kind of think it might be too little too late on that one, but do what you can, right? If you go to my "Gut Health" highlight on Balanced Baig, you'll see a series of snaps where I got super into supplements this summer. My two faves that I'm pretty sure you can just pick up at Whole Foods are Oil of Oregano and Digestive Enzymes. I ran out of my probiotics and, like I mentioned, my bank account is a scary place these days, so that is unfortunately taking a back seat right now, LOL. Oil of Oregano is really good for inflammation and is a natural antibacterial product. This is great if you feel like you're getting run down or when you've been really indulgent. I take the Digestive Enzymes after I've had a huge meal and it helps me feel better. I'm not a scientist, but I feel like these are really helpful. I've mentioned my Headspace obsession, but I feel like being abroad and traveling has helped me to value the present moment so much more. Getting to see new places and make memories has been the most beautiful experience. I get emotional at least twice a day about how grateful I am to be able to experience this life the way that I have. My past fears and obsessions about being "healthy" are so small compared to how incredible our world is. Listen to your body and do what makes you happy. Memories and experiences are so much more important, so I have really tried to just embrace and enjoy every moment of this season that I'm in. A huge fitness "trend" I've been seeing recently is intermittent fasting. I've been casually doing it while traveling just to stay feeling good, but I am super intrigued by the FASTer Way to Fat Loss program that I've been seeing all over social media and IRL... Enter Kelsey Boudreaux! Kelsey was my cheerleading coach my senior year of high school and I'm so glad that we have stayed in touch through social media. This spring, I saw her post her FWTFL transformation (which is amazing!) and, when she became a coach for the program, I knew I had to ask her some questions and bring them to the blog. This is one of my favorite posts I've done in a while, so I hope you enjoy! Tell us a little bit about your health and fitness journey. I've been an athlete my entire life. I've tried about every sport, but was mainly a swimmer and cheerleader for the majority of my middle and high school years. I was the girl who put on the "Freshman 15" because my eating habits went down the drain and I never made time to workout. After starting PT school, I gained another 30 pounds and felt really terrible. Fatigued, foggy, and constantly in a funk. That's when I started the FASTer Way to Fat Loss program, and it's changed my life forever. A long time friend of mine, Chasity Givens, was posting about the program on Facebook and Instagram. I was pretty skeptical at first and put the cost of the program on my credit card. I had no clue what to expect, but I would do it 100 times over again in a heartbeat! What are the basics on Intermittent Fasting and how have you been able to incorporate IF into your busy lifestyle? There's a couple different types of intermittent fasting. The one we follow is the 16/8 rule. We fast for 16 hours a day then eat for 8 hours a day. Some people look at me like I'm crazy when I tell them that, but it's actually pretty easy!! Intermittent fasting is not a diet, it is simply an eating schedule. I still consume about 1900 calories a day, I just do it within an 8 hour eating window. When it comes to digestion and metabolism, your body can be in 2 states: fed or fasted. When we're in a fed state, our body primarily uses sugars (ie glucose and carbs) as its main energy source to burn for fuel. When we're in a fasted state, our body now has to turn to a new energy source to burn for fuel and that's fat. It takes about 12 hours after we've stopped eating to burn off the readily available carbs in our body that we use for energy. After that 12 hour mark, our body turns to burning off readily available fat for fuel. Most people come to me saying "I'm eating clean, but I can't get this weight off!" Implementing intermittent fasting is such an easy way to ramp up your fat loss results. I live on such a busy schedule that I've termed my life a "grab-n-go" lifestyle. Every morning, I literally have to "grab-no-go" out of my fridge for the day. Whether it be leftovers from the night before, chicken salad, snacks, etc. The key to being successful is to make sure you're eating things you love! You do NOT have to settle for meal prepping 6 days of plain rubber chicken and mushy broccoli. I love food and I love a lot of flavor, so I've found things that I like and that I know work. What inspired you to become a FWTFL coach? The success I had with the program was obviously a huge part, but the community I found through the FWTFL was seriously unlike any other. Everyone is so positive, motivating, and empowering! We all have come together to live healthier and more energetic lives, so that we can be the best versions of ourselves, and to me, that's the best part of this program. What are some of the biggest mistakes/misconceptions about health and fitness that you've seen from others and/or from yourself before starting the program? "So if I only eat 1000 calories a day and then burn off 1200 working out, I'll be sure to lose weight right?" NO! Under eating and over exercising will give you very short term results, but in no way is that healthy or sustainable. We have to have the right amount of nutrients to function. Severely restricting food and over exercising is putting incredible amounts of stress on every cellular process in your body and it will actually cause you to retain the weight you're at. We have to feed and nourish the wonderful bodies we've been given! What is some advice for anyone interested in the program and/or just putting their health and self first and where can everyone find your program? My life motto is "you have one life to live, don't waste it on other people." This is YOUR life and you only get one of them! Don't waste it by compromising your health. You have to put your health and well-being first, so that we are able to give back to our families and communities. We all have struggles financially, but I promise you that you can work out for $4 a day for 7 weeks to work towards putting yourself first! The program is entirely online- no meetings, weigh ins, etc. I'll be your coach and teach you EVERYTHING you need to know!! You can follow me on Instagram @kelseyannboudreaux and click the link in my bio there! A huge thank you to Kelsey for taking time out of her busy schedule to answer these questions and be sure to check out her Instagram for her link to the FASTer Way to Fat Loss program! The term "wellness" is such a buzz word right now, but what does it actually even mean? At first, I think I was guilty of thinking of wellness as working out 7 days a week and drinking protein shakes. However, the more I'm on this journey of figuring out life, I'm realizing that I think wellness is figuring out how to live your best life and it isn't a one size fits all kind of thing. In terms of the health aspect of wellness, I see it as being able to nourish and move my body the way that makes me feel good. Going on a walk for an hour listening to a podcast feels better to me than trying to do 100 burpees every day right now. Although sometimes crushing some burpees feels great, just showing up to move my body still makes me feel my best. Eating a super yummy salad or a smoothie with spinach and chia seeds makes me feel amazing, but you know what else makes me feel amazing? Having 2 hour conversations with amazing new friends in Italy while sharing the most delicious pizza and wine. I love food, but I think I love the experiences that come with food more. Finding those amazing moments that light you up and making an effort to chase more of those moments are what wellness is really all about, in my opinion. I'm kind of embarrassed to admit that one of my biggest fears about studying abroad was the unknown of whether or not I would gain weight from eating unhealthy or not working out. Wtf right? The longer I'm here, the more it hits me: what a STUPID fear, Baigin. But hear me out. I was afraid that being put out of my comfortable bubble would rock my view of the role of health and fitness in my life and, I guess, in a way, it has. Like, is this really what I'm interested in and passionate about or is it a "passion" that has developed out of this fear of gaining weight or being "unhealthy"? When thinking about this, I tried to pinpoint when exactly I decided I was going to be a "healthy" or "balanced" eater (whatever that really means). It brought me back to when I was in 4th grade and I gave a presentation to my school's PTO about why we need to make our school lunches more nutritious. As a 4th grader, I was still innocent and social media didn't even exist to influence me to feel one way or the other; it was just something I was genuinely interested in as a 9 year old. As I've thought about it more, I think in terms of healthy eating, it's less about being passionate about the act of eating a healthy meal and more about being passionate about the way eating a healthy meal makes me feel. I was listening to an Oprah podcast recently (click here to listen) where she asked her guest, "When are you your absolute happiest?" and the guy answered, "I'm happy in every moment I'm alive." Normally, I would hear that and laugh a little, but something really resonated with me in that moment. No matter what's going on in our lives, there's something we can choose to be grateful for, all it takes is a little shift in perspective. Being able to shift a moment of stress or anger and turn it into a happy, grateful one is wellness. Worrying about gaining weight or not working out while living in one of the most incredible places in the entire world was a thought rooted in fear. Fear of the unknown of what this experience was going to be like for me and of being taken out of the comfortable bubble and routine I've always known. Trying to shift this perspective to one of gratitude for my experiences in every moment I'm here has lifted a weight off me and allowed me to feel joy and happiness literally in every moment. But you know that feeling when you're really sore from the best workout and even though it was amazing, you literally can't move? That's how my mind feels when I get into bed at night because I'm working muscles of my brain and heart that I never have before. Isn't that crazy? I have never consciously chosen joy in every moment. Of course, I'm not perfect. That's why "wellness journey" is in the tagline of my blog lol. Some days, I let that consciousness slip and am a total Negative Nancy about school or people or my body. The good feeling is in the process of learning and knowing that I tried my best at the end of the day. That's what wellness is, guys. Wellness is showing up for yourself every day to try to your best. We'll never be perfect and sometimes we have silly fears about things we can't control. If you're still reading my ramblings, I'm grateful for you! Let's choose in this moment to be grateful, trust the process, and be our best. At Castello de S. Jorge in Lisbon, Portugal. I will admit, I have not been as good about journaling and blogging as I wanted to be in Spain... I can't believe it has been a month since my last post. I thought I would post a recap every week, but I have really been trying to focus on being present in the moment and not worrying about documenting every single thing on camera which has been really refreshing. I've mentioned my thought provoking morning walks a zillion times, but it has been my time that I absolutely cherish in the morning, by myself just listening to a podcast. I reflect every single day and I need to be better about getting those reflections in writing, so that's what you are reading today. Both photos from Lisbon, aka my new favorite place on Earth. Before I came over to Barcelona, I was really stressed on how I would be able to create a peaceful routine that was similar to what I had been trying to do at home. I'm a morning person so it's really important for me to set myself up for success in my morning routine. Thankfully, Headspace has changed the game for me and I am still able to meditate almost every day. During the week, I wake up a little earlier and sit in my bed in meditate and if I'm traveling, I can do it on the bus to the airport or on a plane. It changes my mood drastically and gives me space in my mind to focus on what really matters throughout my day. I highly recommend it. Today in my meditation the idea was presented that anxiety and negative feelings are like dark clouds covering up a blue sky. The blue sky is always there, but sometimes the clouds are in the way. Similarly, I guess we can think of our dreams and the person we're constantly striving to be as our own personal blue sky. Some days are cloudy, but other days we feel on top of the world, sunny and 75. I guess the take home message here (for me anyways) is that the person that we want to be is who we already are, the clouds get in the way- our fears, self imposed limitations, etc. The difference between the weather and our lives is that every day we are faced with a choice: is it going to be a sunny day or a stormy day? We get to choose. A lot of times, my anxiety or negative attitude follows me because it's a habit that I can't kick. I'm used to feeling anxious and, although I'm uncomfortable, it's an easier and more comfortable choice. However, what we choose to feel every day is either revealing or covering up that blue sky. Beautiful blue sky views from Castello de S. Jorge. For me, my focus right now is finding peace. Being at peace in my mind, spirit, and body, but also with the negative energy that has come into my life in the past. Choosing a positive energy is quite simple if we allow it to be. Choosing to say no to negative people, situations, or energies is the way to move forward and get to a peaceful state. I know you have experienced some form of negative energy at some point in your life. You can feel it the second you walk in the room! But have you ever thought to yourself, "you know what? I'm actually going to say no to letting this into my life." It's something I recently realized on a morning walk and am incorporating that into my journey to finding peace. It seems crazy and maybe even a little silly to place such an emphasis on just saying no, but it's actually harder than you might think. I posted about this on my Instagram story last week, but I was working on a school project with two girls that I had just met and their energy was so positive, it was contagious. It really lit me up and made me feel like I needed to share that energy and that kindness and joy to everyone. So often, we dump our problems on other people- it's normal and it's okay to a certain extent. But we all have that one friend or even those couple of days where we are the friend that is "the dumper": filling up someone else's time and energy with whatever negativity and stress is going on in our life. Unfortunately, I can think of a couple times where I've been a dumper. Kind of similarly, something I've noticed since being away is that I let the thoughts, opinions, and actions of other people have too significant of an impact on my energy. Whether it's thoughts on my future career or my relationship or not getting some validation or credit that I think I've earned, it seems like things I can't really change are negatively impacting my energy. What's even more frustrating is that I'm not saying no! I'm the one that is allowing that into my life. Snaps from my daily walk in Barcelona. My roomie, fellow Gemini, and soul sister Jess. Seriously could not be more thankful that the universe brought us together. Circling back to my main point here, after I met with those girls, I felt so inspired and energetic and really motivated to only be a positive energy for someone else. It can change someone's whole day to share your light and kindness instead of being a negativity dumper and I realized in that moment that that is exactly who I want to be. We have the power literally every second of every day to choose the blue sky. When we walk into room, we are choosing to either share a positive energy or a negative one. We all make mistakes, but being able to be aware of the present moment and check yourself is what counts. Wow that was a lot! If you're still reading, you rock! I guess I've had a lot on my mind in the past month haha. While I share a lot about my life on my blog, I always try to think about what I want the takeaway to be and, lately, I think my focus is being able to share some positive energy. In a world where there seems to be so much negativity, my goal is to just share my journey to choosing to find the light and good energy in every moment. Inside the life of your average college gal finding the balance between fit + fun - Follow along!